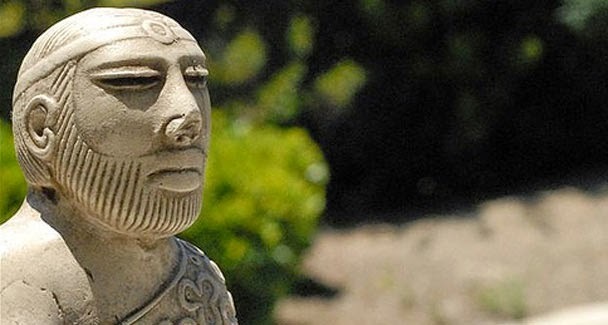 Spencer Wells is a Geneticist,Director of the Genographic Project.In his books "The Journey of Man A Genetic Odyssey” and “Deep Ancestry Inside The Genographic Project,he explains many things,including a genetic marker, M17, which is the signature of the Aryan invaders from the steppe. 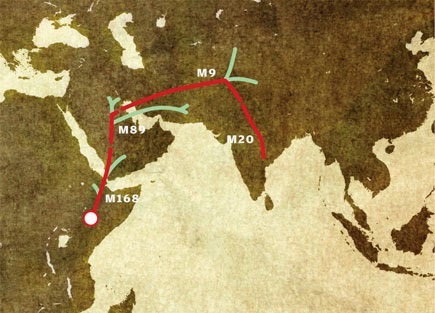 cent or above of the men in southern India have M20.The group that carries Genetic Marker M20 (M168-M9-M20) migrated into India in large numbers (the haplogroup L that has this marker is known as the Indian clan).This migration into India happened approximately 30,000 years ago.As some members of the M9 clan were migrating towards India other members of the group headed north towards Central Asia and Europe.From this group came the M173 marker which is the first large wave of human migration to Europe.For some strange reason some members of the M173 group turned and headed back towards South Asia.may be due to climatic conditions.From this returning group comes the [M168 > M89 > M9 > M45 > M207 > M173 > M17]M17 Indo-European marker.The M17 marker first appears about 10,000 to 15,000 years ago when a man was born on the grassy steppes in the region of present-day Ukraine or southern Russia.His descendents became the nomadic steppe dwellers[Kurgans, nomadic horsemen?] 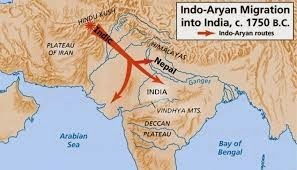 who eventually spread as far a field as India and Iceland.Also Chariots which were developed by this group before 3000 B.C,offered an invaded Aryan warrior a stable platform from which to shoot arrows and cast spears at his enemies,Indus valley dravidian people.Also have the horse,which was domesticated probably a 1000 years earlier in the western steppes was of great importance for them in a war against Indus valley people, because the horse-riding warrior was able to easily maneuver around his Indus valley foot-soldier enemy Today a large concentration – around 40 percent – of the men living from the Czech Republic across the steppes to Siberia,and south throughout Central Asia are descendents of this clan.In India, around 35 percent of the men in Hindi-speaking population carry the M17 marker,whereas the frequency in neighbouring communities of Dravidian speakers is only about ten percent.The distribution adds weight to linguistic and archaeological evidence suggesting that a large migration from the Asian steppes into India occurred only within the last 10,000 years,most probably within 5,000 years.Hence taken with the archaeological data,we can say that the old hypothesis of an invasion of people - not merely their language - from the steppe appears to be true. Russian scholar Yuri Knorozov surmised that the symbols represent a logosyllabic script and suggested, based on computer analysis,an underlying agglutinative Dravidian language as the most likely candidate for the underlying language.Knorozov’s suggestion was preceded by the work of Henry Heras,who suggested several readings of signs based on a proto-Dravidian assumption.Most of the Indus valley seals had been read by Dr. R. Mathivanan and it is established that it is Tamil writings.